IMAGES THEATRE COMPANY Presents WE ARE THE ONES, the story of three youth that are swept up and transported back in time by two Ancient African spirits. It unravels the fabric of African-American history to consider its intricate impact on today’s society while, posing the question of what would life be like if such pertinent heroes/sheroes such as Harriet Tubman, Dr. Martin Luther King, Jr., Malcolm X and many others had not stepped up and into their destinies. 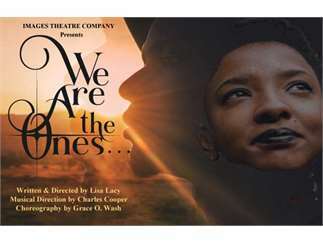 WE ARE THE ONES is a new play with music written and directed by Lisa Lacy, musical direction by Charles Cooper and choreography by Grace O. Wash.
FRIDAY AND SATURDAY @ 8:00 p.m. SUNDAYS' @ 3:00 p.m.